After the iPad was announced for $499, (a few) people asked, "What about JooJoo?" 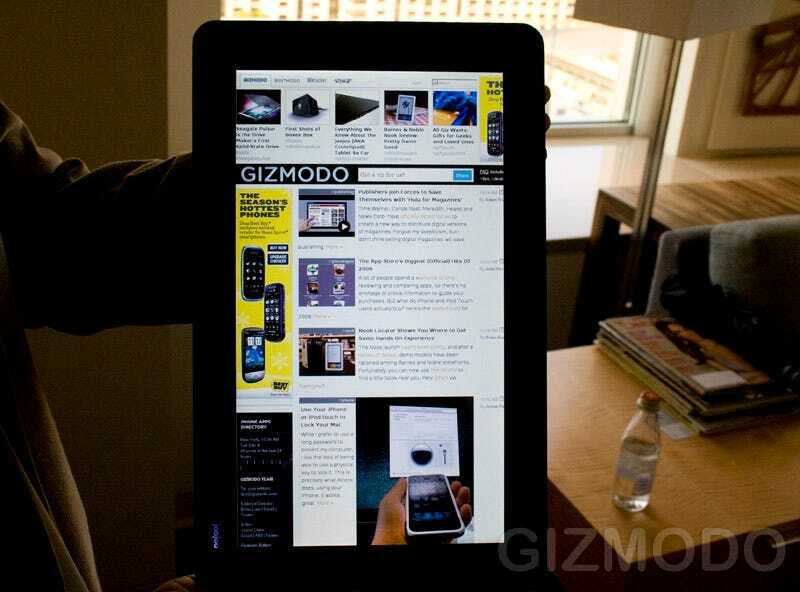 the first $499 web tablet, formerly known as CrunchPad. Well, it's on. JooJoo's now in full production, and plans to open a web app store. I talked to Fusion Garage CEO Chandra, who said they're not only getting another round of investing, they've struck a deal CSL Group, Malaysia's largest OEM—they make fabulous BlackBerry knockoffs called Blueberrys—to cover their full outgoing manufacturing cost in exchange for revenue sharing. In other words, CSL's covering the cost to make the tablet (which is being made by one of the "top three or four" Taiwanese OEMs, according to Chandra), and CSL gets a slice of cash from every JooJoo sold. The upshot is that they're expecting to hit their target of shipping JooJoos within 8-10 weeks of taking pre-orders—so like, end of this month—with enough produced to "meet demand," though Chandra wouldn't reveal specific numbers. To that end, the other thing the iPad has over JooJoo is that app developers can tap into the hardware natively, which is why Fusion Garage is introducing APIs to let web developers get at the JooJoo hardware, like to use the accelerometer for gaming. Chandra says that the APIs are "unique, but standards driven," and easy to extend current web apps with their relatively simple APIs. We'll see. Asked what he thinks about the iPad more broadly, and Chandra said that he's amazed Apple's jumping "into a category that we've defined." He points out that JooJoo is African for "magical," which is exactly how Apple described iPad, and that the iPad even comes in at the exact same pricepoint of $499. (No, I'm not really sure how "African" is a language.) But, despite Apple being, uh, Apple, he thinks JooJoo has a few advantages: They're launching first; they've got a bigger screen (12.1 massive inches); and it's an "uncompromised" web experience, since they'll have Flash, and you'll be able to use sites like Facebook in their full glory, not miniaturized app form. Them's is fighting words, for sure. I'm glad to see them pushing on in the face of crushing odds, actually, to keep things interesting, if nothing else. SINGAPORE, February 3, 2010 – Fusion Garage today announced that its category-creating JooJoo Internet tablet has moved into full production with initial shipments expected to reach consumers at the end of February. Helping fuel the JooJoo's arrival and Fusion Garage's next phase of corporate growth is an innovative manufacturing agreement and strategic investment from mobile device OEM and distribution giant CSL Group of Malaysia. Fusion Garage is expected to announce a second round of investment within the next two weeks which would augment today's investment from CSL and the company's initial round secured in November 2009. CSL, established in 1998, has rapidly grown to a major conglomerate, with sales of nearly $300M USD, and the organization is one of the largest manufacturers of cell phones, mobile devices, netbook and notebook computers in SE Asia. The strategic relationship between the companies calls for CSL to absorb all up front manufacturing costs associated with JooJoo production. This agreement virtually eliminates the normal high cost of mass market entry - often in the tens of millions - for any emerging Consumer Electronics (CE) hardware developer. In exchange, CSL will receive a revenue royalty from each JooJoo sold globally. Additionally, CSL has made a strategic venture investment in Fusion Garage which will help the company to move to the next phase of its corporate growth and product development. "This is landscape changing manufacturing agreement in the CE hardware market in much the same way Dell changed the PC business model with its direct to consumer sales approach back in the 1990s," said Fusion Garage founder and CEO, Chandrasekar (Chandra) Rathakrishnan. "CSL's confidence in JooJoo and strategic investment enables us to concentrate on the expansion of our organization, software development and, ultimately, building a world class CE company." "We are justifiably bullish - not only on the promise of the JooJoo and the Internet tablet market's potential but also on Fusion Garage's forward looking vision," said Dato Eric Chuah, Chairman of the CSL Group of Companies. "We have an opportunity to expand our business via this relationship, enter a hot market with a trusted partner and turn the traditional CE hardware manufacturing model on its head. We are betting on volume here and firmly believe our bet will be a winner." JooJoo, officially introduced in December 2009, is the category-creating Web tablet that provides near instantaneous Internet access and the best online experience. The African word "joujou" means magical object and Fusion Garage's JooJoo brings users into an online world where everything on the Internet is just a single touch away. Powered by Fusion Garage's innovative browser-based operating system, JooJoo enables users to quickly and easily tap into Internet applications, news, music, high definition video, social media and web services. JooJoo has revolutionary hardware, including the largest capacitive touch screen of any device on the market – 12.1 inches –providing full screen content viewing. Its ultra-portable, ultra-thin design offers the best Internet experience anywhere – on the couch or on the go, standing or sitting. JooJoo's gesture-based user interface allows easy transitions between Websites and turns pages in a digital publication via the movement of a finger. A full-size touch keyboard appears when users need it, and disappears when viewing content or paging through digital content. JooJoo is available directly from Fusion Garage at www.thejoojoo.com. Fusion Garage enables the best Internet experience through innovative software and hardware devices. Founded in 2008, Fusion Garage's core browser-based operating system provides near instantaneous Internet access and has spurred the development of an entirely new category of consumer electronics devices dedicated to online usage. Fusion Garage is based in Singapore and is privately funded.